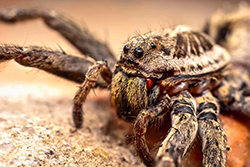 ApolloX Pest Control will remove wolf spiders from your home quickly, efficiently, and safely. Hogna carolinensis wolf spider females are 22 to 35 millimeters in length, and the males are 18 to 20 millimeters. The carapace is a dark brown with scattered gray hairs that are typically not arranged in any discernible pattern. The abdomen is similarly colored, with a somewhat darker dorsal stripe. The legs are a solid color. Hogna aspersa wolf spider females are 18 to 25 millimeters in length, and the males are 16 to 18 millimeters. They are similar to H. carolinensis in body color but have a distinct narrow line of yellow hairs on the carapace in the vicinity of the eyes. The legs are banded with a lighter brown color at the joints. The males are much lighter in color than the females, and only their third and fourth pairs of legs are banded with a lighter color. 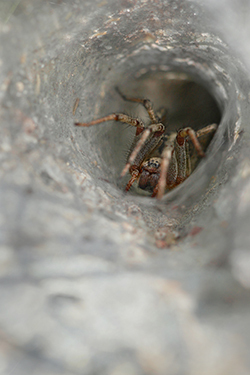 The wolf spider is common household pest in the fall when they are looking for warmth. 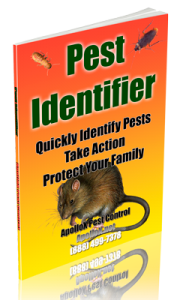 They are commonly found around doors, windows, house plants, basements, and garages. They do not spin a web but roam at night to hunt for food. The wolf spider is shy and seeks to run away when disturbed. The wolf spider builds retreats (holes or tunnels) in the soil; under and between boards, stones, and firewood; under siding; and in similar protected areas. They are hunting spiders and only come out of hiding during the night to look for prey. Mating occurs in the autumn, and the males die before the onset of winter. The fertilized females overwinter in protected locations, including human-made structures, and produce egg cocoons the following May or June. The spiderlings hatch in June and July and will attain only half of their full size by the following winter. They too will overwinter in protected sites and complete their growth the following spring and summer. The females may live for several years beyond the year in which they reach maturity. 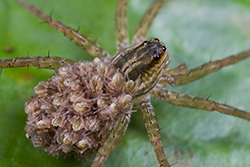 It is common to find the females carrying their young spiderlings on their backs during the summer months. 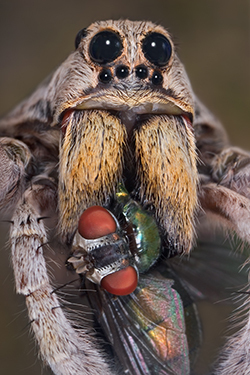 The wolf spider will bite if handled or if trapped next to the skin. However, their venoms are not very harmful to humans. Typical reactions include initial pain and redness, which subsides with time. No serious medical consequences of these bites have been noted. 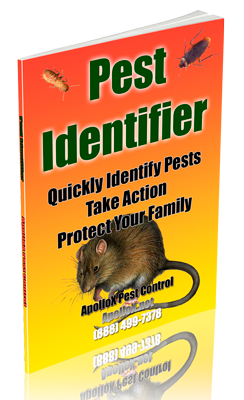 Call ApolloX Pest Control for wolf spider pest control in the Fairfield County CT towns of Fairfield, Black Rock, Bridgeport, Cos Cob, Darien, Easton, Greenfield Hill, Greenwich, New Canaan, Noroton, North Stamford, Norwalk, Old Greenwich, Redding (lower), Ridgefield (lower), Riverside, Rowayton, Shelton, Southport, Stamford, Stratford, Trumbull, Weston, Westport & Wilton.